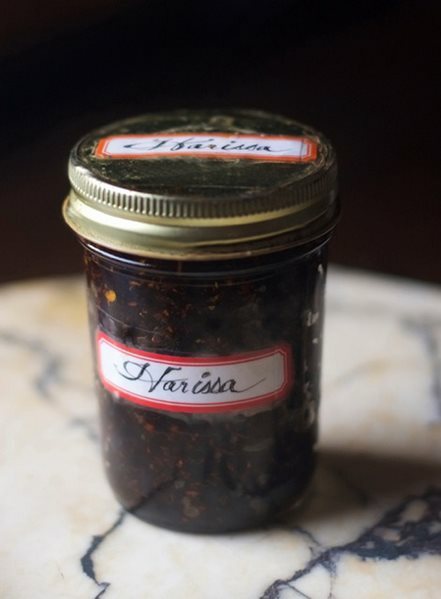 My First taste of Harisa wasn't in a spice-scented market in North Africa. No, it was at a farm in upstate New York, in the dead of winter. I used a recipe in a book whose title I have long forgotten. Looking like a simple dark pepper paste, it was nothing less than transporting–an accompaniment with the power to eclipse the main course. It changed my culinary life. Really. I barely noticed winter’s chill that season as I began rubbing harisa’s mahogany magic onto my roast chicken, spooning it over my fish and brightening my roasted vegetables. Spicy, sure, but dark and mysterious in flavor as well as color. Just pre-paring it filled the kitchen with an intoxicating fragrance that compelled me to make it over and over. (Friends demanded jars of the stuff.) I have been in love ever since. Harisa comes from the Arabic word for “to break into pieces." My favorite recipe remains close to the harisa I fell in love with. It has dark color and a flavor you won't find in most of the bright red pastes now sold in tubes and jars in stores. Remove the tops and seeds from the chilies. Put them in a hot skillet and toast for a few moments on each side: They will begin giving off a spicy perfume. Be careful not to burn them. Cool a bit and tear into pieces. Now put the caraway, coriander and cumin in the hot pan, and toast them for a few minutes until they give off a wisp of smoke; remove immediately. Pound the garlic and chilies together. Place them in a blender or spice mil, add the spices and grind as finely as possible. Add the salt and hot pepper sauce. Grind enough to mix thoroughly. Put into a small mason jar and pour on enough olive oil to cover. Stir in the oil. Add a bit more to cover again. Seal and refrigerate; serve at room temperature. Today harisa is so woven into the cuisines of North Africa that you might assume it has always been there, but if there has ever been a great reason for immigration, free trade and porous borders, this is it. There would be no harisa if one of the New World’s most famous vegetables hadn’t turned up the heat on virtually all of the Old World’s cuisines. Before chilies came to the Old World, there were varieties of black pepper, Szechuan pepper, cloves, cinnamon, ginger, mustard and horseradish to warm palates from China to London. Ancient China and the Mideast had salty condiments like soy, which was originally a paste, and the equally salty murri in the Fertile Crescent. Black pepper, though both widespread and prized, was rarely a stand-alone condiment—unlike mustard, which has been on the menu in China for at least 2,500 years and appears in medieval recipes from the Middle East, Africa and Andalusia as well as Europe since Roman times. Soon after capsaicin-bearing New World peppers landed in North Africa, cooks began using local sweet spices like caraway and coriander to transform dried peppers into early variations of the harisa that now, some six centuries later, is enjoying a new global popularity. Walk through New York’s West Village or a few boulevards in Paris, and you find it spooned over falafels or heating up a tagine. From Spain to San Francisco, it’s even showing up in non-traditional recipes like a grapefruit vinaigrette or a salad with wheatberries, carrots, dates and yogurt. I have been known to add it to mayonnaise to take a chicken sandwich to an unprecedented level; blend it with brown butter on Brussels sprouts; even dot it on pizzas. And why not? Its complex heat seems to bless everything it touches, and yet it is easy enough for anyone to make. Wright suspects harisa—or at least the idea for it—may have come from the New World with the peppers them-selves. “One could argue that the Peruvian aji panca en pasta is such a precursor,” he says, explaining that, like harisa, it is made with rehydrated chilies. “When you think about the way new food ingredients are sold in a market, one of the first questions any prospective customer will ask is, ‘What do you do with it?’ These dried fruits from a magical New World would be an easier sell if there were techniques, recipes or even a sample,” he adds. My own favorite recipe (above) remains close to the harisa I fell in love with. Instead of reconstituting the dried chilies, I toast them to concentrate their flavor. Then I pulverize them, together with spices and garlic, and I stir in the oil at the end. It keeps at least a year in the fridge—if you can let it last that long. My very favorite way to have it is slathered with honey on a buttery flatbread such as a crepe-like Moroccan m’semme, sprinkled with black olives and sometimes a bit of goat cheese. 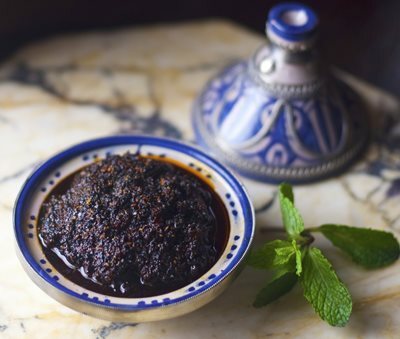 This addictive combination of hot, sweet and salty is a popular street food in North Africa—edible evidence of why chilies spread through the world like wildfire with every bite. ([email protected]) is a New York film production designer who also writes about food, style and history and regularly attends the Oxford Food Symposium. Readers of her blog “Lost Past Remembered” often come for the recipes and stay for the stories.